Since 2003, Elon’s art history program sponsors a speaker series that has brought world-renowned art historians to campus. With several talks scheduled per year, the series gives students an opportunity to interact with the major scholars in the field. Past speakers include: Timon Screech, Norman Bryson, Terry Smith, Carol Duncan, Barbara Abou-el-Haj, Frank K. Lord, esq., Rebecca Brown, Carol Mattusch, John Neff, Gennifer Weisenfeld, Rebecca Martin Nagy, Dorothy Verkerk, Judith Rodenbeck, Rachael Ziady DeLue, David M. Lubin, Mary D. Sheriff, James Elkins, and Jaroslav Folda. Students are encouraged to recommend scholars they wish to meet. 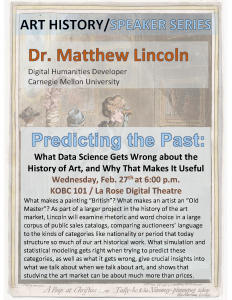 Matthew Lincoln, “Predicting the Past: What Data Science Gets Wrong About The History Of Art, And Why That Makes It Useful”LaRose Digital Theatre, Koury Business Center, 6 p.m.
What makes a painting “British?” What makes an artist an “Old Master?” We can define these categories as a function of historical factors like birthplace or time, or of style, technique or subject matter. 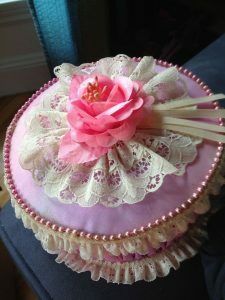 But we also know full well that these are highly constructed categories; as much as anything else, “Britishness” (and other categories) can be imparted by shared rhetorical conventions for describing an artwork or an artist, and that definition can change with time, or diverge depending on who is doing the describing. As part of a larger project in the history of the art market, Dr. Lincoln will examine rhetoric and word choice in a large corpus of public sales catalogs, comparing auctioneers’ language to the kinds of categories like nationality or period that today structure so much of our art historical work. What simulation and statistical modeling gets right when trying to predict these categories, as well as what it gets wrong, give crucial insights when we talk about art and shows that studying the art market can be about much more than prices. Matthew Lincoln is the Digital Humanities Developer at dSHARP, the digital scholarship center at Carnegie Mellon University, where he focuses on computational and data-driven approach to the study of history and culture. His current book project with Getty Publications, co-authored with Dr. Sandra van Ginhoven, uses data-driven modeling, network analysis, and textual analysis to mine the Getty Provenance Index Databases for insights into the history of collecting and the art market. He earned his Ph.D. in Art History at the University of Maryland, College Park, and has held positions at the Getty Research Institute and the National Gallery of Art. He is an editorial board member of The Programming Historian. Yeager Recital Hall, 6:30 p.m. The history of art—particularly medieval art—might seem irrelevant to our daily lives. But images, screens, and visual culture play an enormous role in twenty-first-century culture, and we often encounter medieval references in extremely politicized contexts. What are an art historian’s responsibilities in this arena, and how can they contribute to public scholarship beyond the university? In this presentation, Maggie M. Williams, a founding member of the Material Collective, will discuss how and why she has worked to combine activism and public outreach with academic scholarship. Her talk will address the relevance of art history and the study of the past to life and politics in the contemporary world. 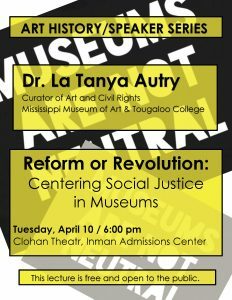 Clohan Theater, Inman Admissions Building, 6 p.m.
La Tanya S. Autry, Curator of Art and Civil Rights at the Mississippi Museum of Art and Tougaloo College, discusses how we can decolonize our museums and create socially just centers. Her critique calls for systemic change grounded in intersectionality and equity. In challenging the status quo, she questions the very definition of museums. While completing her Ph.D. in art history at the University of Delaware and working as a curatorial fellow in photography at the Yale University Art Gallery, Autry co-curated, with Gabriella Svenningsen Omonte, The Art of Black Dissent, a traveling pop-up exhibition and dialogue-based program (https://theartofblackdissent. wordpress.com/about/). She also began an internationally crowdsourced list of social justice and museum resources in the wake of #museumsrespondtoferguson and collaborated with Mike Murawski on “Museums Are Not Neutral”. 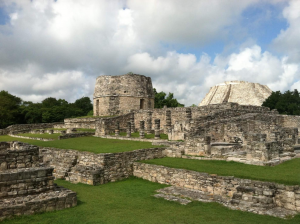 Claudia Brittenham’s research centers on the art of ancient Mexico, Guatemala and Honduras, with a special interest in issues of art and identity, intercultural interaction, the materiality of art and the politics of style. 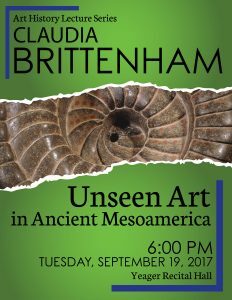 Her current research project examines problems of visibility and the status of images in Mesoamerica. Unlike objects made to be displayed in modern art museums, many visually elaborated Mesoamerican objects would have been extraordinarily difficult to see in their original contexts. By exploring these conditions of visibility, Brittenham suggests that art could operate beyond the realm of the visual, and explore the ways in which concealed images and esoteric knowledge might be used to maintain power and social difference. Yeager Recital Hall, 6:00 p.m. In the twelfth century, the use of memory techniques spread from orators and clerics to include parishioners, who used them when passing by the village church to recall the gist of sermons or moral lessons they had heard. Sculptural and architectonic elements on the 12th-century rural French churches show distinct parallels with known textual and mnemonic practices of that period. The use of specific visual devices, shocking imagery, and patterns of order within the decorative scheme of these churches transform the structures into literal memory palaces that continue to provide visual clues to lessons and texts long since forgotten. Art History Lecture Series / Admission is free and open to the public. Overbey’s talk will focus on the materiality, affect, and agency of reliquary jewelry. 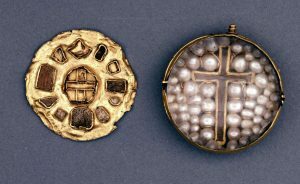 As containers for holy relics, personal objects such as pendants, rings, and belt buckles offered extraordinary intimacy with the divine; they also implicated the beholder in a broader Christian cosmology that depended on historical, theological, and sensory encounters with the material of reliquaries, including gold and precious gems. At the heart of this talk is a small, badly damaged rock crystal pendant reliquary, which Overbey argues created a material space where medieval Scotland and the Holy Land met through matter and imagination. This talk is part of Overbey’s current project, Material Spaces, which explores the algorithmic, diagrammatic, and spatial aspects of objects/images in medieval Britain. Overbey’s first book, Sacral Geographies (Brepols, 2012), focuses on how kings, churchmen, and other influential patrons shaped the cult of the saints at the same time they shaped the kingdoms and narratives of medieval Ireland. 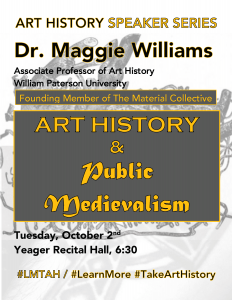 Art History Speaker Series / Admission is free and open to the public. The history of art is not one. Rather, taken from the vantage of what might seem deeply and canonically Western, that is, that classic of the academic painting tradition Ovid’s Metamorphoses, the history of art is already positioned on the transitive, altering, and globalizing hyphen. Through a series of propositions and case studies that move transhistorically but also globally, Casid demonstrates how re-versings of this Roman imperial text’s metamorphic scenes across a range of media work the sly and destabilizing, transformative properties of hyphenation. The ostensible foundations and origins of the Western canon of art history also shake the very ground of tradition. The talk builds on Casid’s scholarship which has been dedicated to developing, both theoretically and historically, how imagination functions as a materializing social and political activity that shapes not just experience of a body, globe, or world but also the very matter that images might seem merely to represent. From transplantation as the engine of empire to the scene of projection as a pedagogical device that produces its subject, her research pursues the role of imaging in shaping the global. A historian, theorist, and practicing artist, Jill H. Casid is currently Professor of Visual Studies at the University of Wisconsin-Madison where she founded and served as the first director of the Center for Visual Cultures. She received her B.A. with honors from Princeton, her M.A. from the Courtauld Institute of Art at the University of London, and her Ph.D. at Harvard. 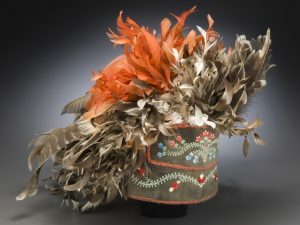 Her contributions to the transdisciplinary field of visual studies include Sowing Empire: Landscape and Colonization (Minnesota, 2006) and Scenes of Projection: Recasting the Enlightenment Subject (Minnesota, 2015) and the coedited volume Art History in the Wake of the Global Turn (Yale, 2014). Travis Chamberlain is the Associate Curator of Performance at the New Museum in New York City as well as a New York Times-recognized director and producer whose recent work explores issues of legacy in contemporary performance through various forms of public engagement. In 2013, he was named one of Blouin Art Info’s “10 Cutting-Edge Curators From Around the World.” One of his recent curatorial events, “Performance Archiving Performance”, was a multi-platform presentation of projects that engage archive as medium, including work by a canary torsi, Jennifer Monson, Julie Tolentino, and Sara Wookey. 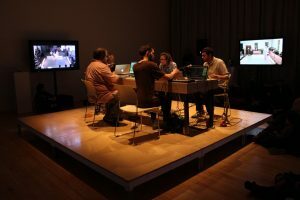 Within these artists’ projects, the acts of recording, storing, indexing, and redistributing are as much a part of the work as the performance itself. As a result, the site of performance—its position in time, space, and form—is placed in question so that the actual process of archiving may be interpreted as its own mode of performance, its own singular event. Presented as part of New Museum’s 2013 Fall “Archives” Season organized by the Department of Education and Public Engagement, “Performance Archiving Performance” included an exhibition of these projects, an accompanying series of residencies, open studios, an experimental study program for teens, a workshop for families, published dialogues with the Museum’s Digital Archivist, and a lineup of performances and public talks with artists, curators, and scholars. Together these platforms provided an opportunity to reassess the role of archives and the Museum’s responsibility for their evolving forms. For this talk, Chamberlain will share a virtual walk-thru of the entire “Performance Archiving Performance” project and discuss the impact it continues to have on the Museum’s own performance document. Erica Rand’s book Red Nails, Black Skates: Gender, Cash, and Pleasure on and off the Ice (Duke, 2012) was an experiment in writing, thinking, and connection, an attempt to step away from disciplinary conventions about argumentation, articulation, and objects of study. This talk begins in a gift offered across numerous divides—rural/urban, female/femme, hips shaped and shapely—to reflect further on writing with visual culture. She focuses especially on queer and gendered dimensions of material and conceptual heft, including received notions of serious intellectual labor and, conversely, of fluff, that may harbor external or internalized sexism or anti-queerness, among various prejudices about what meaning-making and whose meaning-making matters. Dr. Asa Mittman is Associate Professor of Art History at California State University, Chico. 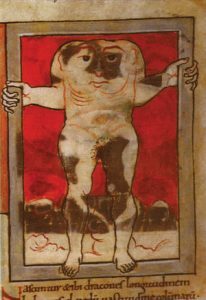 He is the author of Maps and Monsters in Medieval England, co-author of Inconceivable Beasts: The Wonders of the East in the Beowulf Manuscript, and A Research Companion to Monsters and the Monstrous. This talk will examine images of and text about the “monstrous races” — as well as current critical race theory — in an effort to determine if they are indeed “monstrous races,” and if we should retain or reject this characterization. The so-called “Monstrous Races” have been a popular feature of literature and art since the Ancient Greek period, when Herodotus included descriptions of cyclopses, cynocephali, and werewolves in his influential Histories. The fascinating descriptions of these wonders, believed to dwell in the distant and mythologized “East,” were repeated by Pliny the Elder in his Natural Histories, and from there, became widely distributed in the ancient and medieval worlds. In recent years, they have received great and much deserved attention from scholars, but one important element has remained almost wholly absent from such discussions. They are, again and again, referred to as “monstrous races,” and while scholars have paid close attention to their status as monsters, we have not interrogated their status as “races.” Are they races? What could this term mean for medieval audiences, and how does its use influence modern perceptions of these beings? 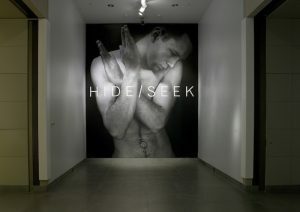 Dr. Katz is co-curator of Hide/Seek: Difference and Desire in American Portraiture, the first queer exhibition ever mounted at a major US museum. He directs the doctoral program in Visual Studies at the University at Buffalo and is presently completing a new book, The Silent Camp: Jasper Johns, Robert Rauschenberg and the Cold War, to be published by the University of Chicago Press. This lecture explores why in the art world of the late 50s and 60s, before difference was particularized, specified, embodied, and made over into artistic identity, a single, universal human capacity—Eros—was elevated to determining status and made ground for a global politic of social liberation. 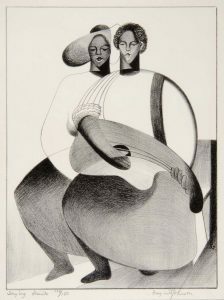 For a few short years, a diverse group of artists, female and male, queer and straight, as different as Richard Hamilton, Lygia Clark, Franz West, Andy Warhol, Yoko Ono and Carolee Schneemann produced an art that, in politicizing the body while obfuscating its signs of differentiation, paradoxically engendered the very specific contemporary social categories like feminist and queer that now obscure Eros’ formative and foundational role. 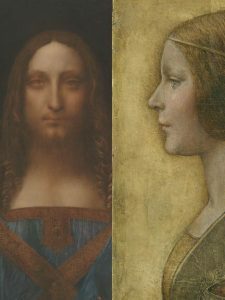 Martin Kemp, Emeritus Professor in the History of Art, Trinity College, Oxford and author of Leonardo and Christ to Coke: How Image Becomes Icon, will discuss intersections of art history and forensic science in the attribution of recently discovered works to Leonardo da Vinci. A light reception will follow the talk. La Rose Digital Theatre, Koury Business Center, Room101, 4:00 p.m.
Dr. Kirstin Ringelberg will serve as moderator. A reception will follow. This event is free and open to the public. 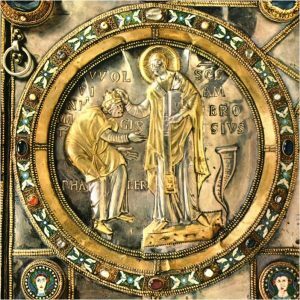 Is it possible to discuss early medieval artistic identity? Danielson explores the ways scholars have worked to attribute early medieval objects with their makers and centers of production. During the first decades of the twentieth century, art historians regularly employed the themes of nationalism and authenticity to characterize those relationships. Far more than exercises in connoisseurship, these elaborate schemas often replaced the absent biography with narratives that served a variety of regional interests.